Pizza Hut — home of Canada’s favourite personal pan pizza, is adding even more excitement to its menu with the introduction of brand new gourmet pizzas for one. Chef inspired Signature Singles combine Italian-style thin crust with unique and premium toppings. Extra cheese please! Cheese lovers across the country will melt over this pizza’s medley of gooey cheddar, parmesan, pizza and fresh mozzarella. Bold yes! But big on taste! 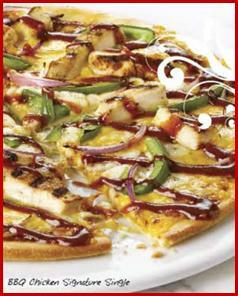 Enjoy both the sweet and savoury flavours of grilled chicken breast, gooey cheddar, pizza mozzarella, crisp green peppers, red onion and a smoky BBQ sauce. Seafood enthusiasts will enjoy the delectable hybrid of juicy shrimp, zesty lemon sauce, pizza mozzarella, roasted garlic and marinated Roma tomatoes. Feel the heat with a spicy combination of hot peppers, savoury pepperoni, bacon crumble, beef topping, sliced ham and pizza mozzarella, laid over a delicious layer of Old World sauce. Signature Singles are available at participating dine-in locations. Check PizzaHut.ca for a list of participating restaurants.